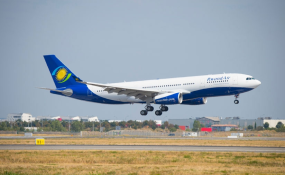 RwandAir launches its maiden direct flights to London (file photo). Africa's aviation market is predicted to top the global charts over the next 20 years. The industry growth is projected to be around 6 per cent on an annual basis, and it is a sector that many players believe has untapped potential. Hassan El-Houry, an aviation expert, argues that African aviation is an industry operating far below its potential. In his new book, Fly Africa, which he co-authored with Eric Kacou, makes a case for Africa's aviation sector. Indeed, the potential that the continent's aviation sector has is unprecedented. This is seen in countries like Ethiopia which leads the continent in the sector, Kenya, Egypt, South Africa, and Morocco. "Rwanda is one of the few countries in the region that have proved that aviation can be developed," El-Houry, who is also the Chief Executive Officer of National Aviation Services (NAS), a Kuwait-based company, says. Most of the African countries that have prioritised aviation, are creating economic impact - jobs, receipts and contribution to the Gross Domestic Product (GDP), he says. "Things are improving very fast and that is to the benefit of passengers, airlines and countries' economies. Last year Africa was the most improved continent from aviation safety perspective," El-Houry says. NAS announced it would invest $50 million in Africa's aviation sector for the next three years. One important argument experts make is that Africa needs aviation connectivity to fast-track growth. Unfortunately, El-Houry says, a lot of governments support national carriers by limiting outside competition, and this means less connectivity. "We need to remove barriers of African airlines travelling within Africa," he says, pointing out how many African countries still block other African countries' airlines to fly in their countries. This year, the African Union unveiled what is ostensibly a transformative initiative for Africa's aviation, the Single African Air Transport Market (SAATM). However, there are only 23 out of 54 countries that have so far signed up to the agreement. "For instance, we haven't been able to introduce new generation of equipment that makes ground handling efficient. This can be possible only if we invest in local manufacturing industries," he says. "Aviation is supposed to be run as a business model, not as political model," he notes.